We were very excited to be commissioned on behalf of Sky Atlantic to make Dragon Eggs for the launch of series 3 of Game of Thrones earlier this year. The initial approach was simply “can you make a dragon egg?” to which we replied “of course!”. 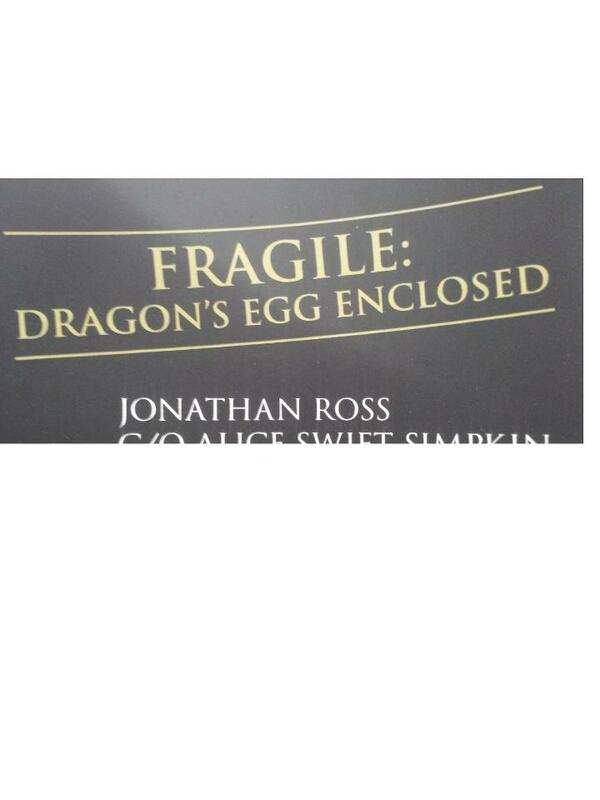 We had previously made a Dragon Tea Easter Egg so we assumed that this was what was needed. 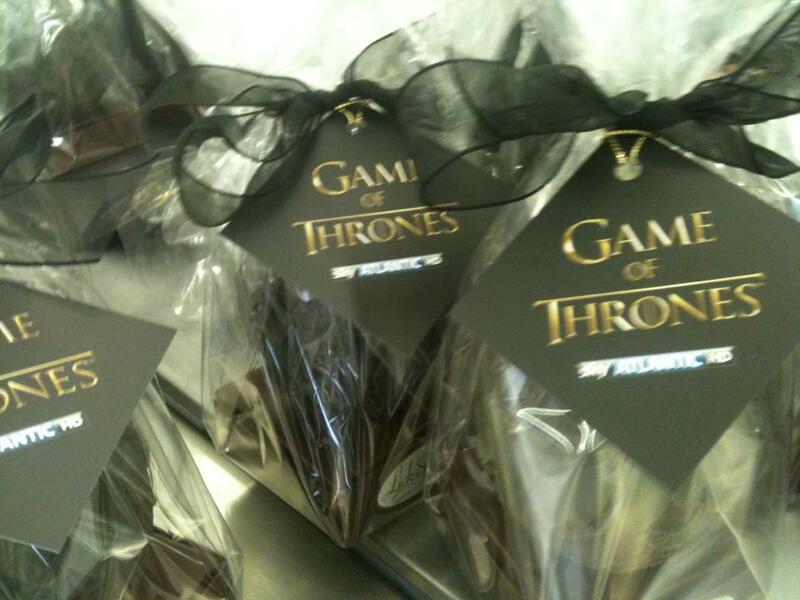 However once we were shown pictures of the eggs required and revealed it was for the launch of Season 3 of Game of Thrones the race to create an accurate prototype was on! Until this point we weren’t familiar with the significance of the Dragon Eggs to the HBO series, and equally we had no idea just how big the television series was or how large and loyal the fan base. In the series Daenerys Targaryen is given three petrified dragon eggs as a gift for her wedding to Khal Drogo. The three eggs are black, green and yellow and are initially in poor condition; covered in grime and looking more like stones than egg-like. (image copyright HBO, Sky Atlantic). The Dragon Eggs were clearly going to play an important part in Season 3 and also neatly tied in as the series was to launch over the Easter weekend. We were couriered a replica stone egg and Blueray of the TV series to help us replicate the eggs, though time was short we received the commission on the Wednesday and they needed to be sent on the Tuesday of the following week! We also didn’t have a Blueray player between us! Diana and the team tried different methods of making the prototype eggs. Due to the short deadline involved the only way to make them was freehand, Dragon scale by chocolate Dragon egg scale, similarly the decoration was entirely hand painted in cocoa butter. The prototype egg was made in a day and shown to SkyAtlantic who then gave the go ahead for a batch of eggs to be made ready for the series PR launch. Diana and the team worked through the weekend in parallel with Sky’s PR team who designed and made custom tags and address labels for the Eggs. Though we are used to dealing with high profile customers our jaws dropped when we received the recipient list which was not surprisingly a who’s who of television, newspapers, magazines and radio including Jonathan Ross, Chris Evans and Caitlin moran. All of the eggs were dispatched on time to their recipients with special collections arranged to ensure the delivery went smoothly. We followed Twitter with interest over the following days as the recipients received their eggs and posted pictures thanking SkyAtlantic. Half an Hour before the series launch Times Columnist, Game of Thrones fan and celebrated Tweeter Caitlin Moran put out a tweet of her Dragon Eggs to her 500,000 followers. The Dragon eggs were superbly received and turned around in a very short space of time, a brilliant piece of show launch PR by SkyAtlantic. Game of Thrones is an HBO series shown in the UK by SkyAtlantic. These Chocolate Dragon eggs were a special commission for SkyAtlantic and aren’t available for general sale on our website. This entry was posted in Blog, Corporate Chocolate Gifts. Bookmark the permalink.